• The last time Jenn Grant released a full-length, she earned Exclaim! 's Mark of Excellence for her 2011 disc Honeymoon Punch. She's hoping for similar success when she releases the follow-up, The Beautiful Wild, which comes out on September 25 through Six Shooter Records. Until then, you can stream the whole thing on Exclaim.ca. • A press release notes that this disc finds Grant "[following] love's twisted, tangled path deep into the heart's jungle" and getting lost in its "savage and sublime experiences." • This dramatic subject matter is conveyed with "dense, exotic" instrumentation that includes harp, flute and sitar in the album's arrangements. The collection also highlights Grant's singing, as she continues to grow as a vocalist. Among the guests who contributed to the album are Old Man Luedecke, Rose Cousins, Kinley Dowling (Hey Rosetta!, the Express), David Christensen (the Heavy Blinkers) and the Halifax Boys Honour Choir. To hear what Grant and her collaborators cooked up, listen below. • Also, you can watch the new soft-focus and nature-filled video for the album track "In the Belly of a Dragon," at the bottom of the page. • Grant is touring this fall with Kathleen Edwards and Cuff the Duke, respectively. • So says the old-timey announcer in the opening to Jenn Grant’s latest album, released Tuesday, September 25, 2012. Produced by Daniel Ledwell (who also happens to be her husband), The Beautiful Wild is a triumph for Jenn, showcasing her growth and maturity as a musician since 2011′s Honeymoon Punch. • Where Jenn’s early records took (by and large) a very moody tone, and Honeymoon Punch showed a new, upbeat style for this East Coast-er, The Beautiful Wild comes across as a perfect harmony between the two. With plenty of catchy songs and heartstring-tugging lyrics, this album shows a new depth and maturity born from the passage of time and the endurance of pain and heartache. Jenn has known difficulty and she has known joy, and both are evident on this record. • One of the things that draws me to Grant above all else is her unique way of forming words. It’s not an accent, per se, but more the way in which she shapes vowels and sounds, as though she’s rolling each syllable around in her mouth, finding every edge and corner and moulding them to her taste. It’s difficult to describe but unmistakable when you hear her sing, and one of my favourite things about any of her music. 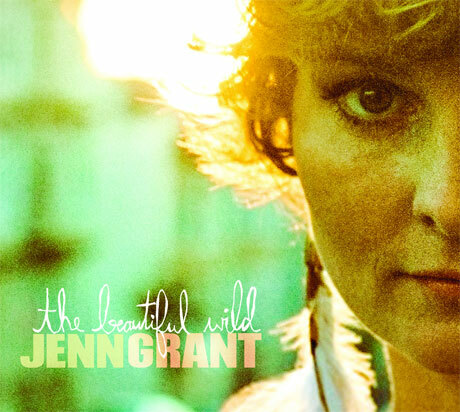 Standout songs on The Beautiful Wild include The Fighter, White Dove, and In The Belly of A Dragon (which is also the first single from the record). • My personal favourite so far, though, is the more melancholy and nostalgic Hollywood. Singing of driving your car down Hollywood Boulevard / wishing we were still swimming far from the stars, Jenn draws the listener into an achingly beautiful tale of deep– but comfortable– love, that feels more like a memory than a story one is being told. The refrain of I’d still be dreaming of you lulls you into a beautiful, sleepy sort of trance and brings about a longing for old love. • Other highlights on the album include the Halifax Boys’ Honour Choir which is featured on the lovely harp-laden I Want You Back, and Michael; the closing track, titled on the jacket Green Grows The Lilac, is also particularly fun. Beginning with an old track (traditional, 1958), it then transitions into a hauntingly beautiful, piano-backed rendition of Eye Of The Tiger (for real). I wasn’t 100% sure what I thought of it, originally, but the more I listen to it the more it’s grown on me. Definitely one to check out! • For all its strong points, The Beautiful Wild does occasionally fall short. I Want You Back, which would otherwise be one of my favourite tracks, is one of a couple songs on the album that has a strange, doo-woppy background vocal thing going on. Especially on this song, with Jenn’s trademark ethereal vocals and Ellen Gibling’s gorgeous harp playing, the strong male vocals doing that “repeating the end of the previous line” thing seem jarringly out of place. However, it’s a small quibble with an otherwise fantastic recording. • Jenn has joked that she “married into good production”, and while this is true (Ledwell is also the genius behind her Honeymoon Punch and Gabrielle Papillon’s latest, Little Bug), The Beautiful Wild is a testament to her incredible talent. With last year’s Juno nomination and Canada Day performance on Parliament Hill for Will & Kate (among a few million others), it appears that this Haligonian-by-way-of-PEI musician is well on her way to receiving the recognition she deserves. • The Beautiful Wild is out now– you can buy it on iTunes, at local record stores (Taz and Obsolete, to name a couple, in Halifax), and at shows along her fall tour. Definitely worth the purchase (and get yourself out to a show if you can)!